This prewar pope was the author of thirty encyclicals, the first to use radio, holder of three doctorates from the Gregorian University, and a serious advocate of mountain climbing. Pius XI took as his motto, "Christ's peace in Christ's kingdom," to make the point that the Church should be active in the world, not isolated from it. In this chapel we also find two modern works. On the right is the statue of Pius XI (1922-1939), the first sovereign of Vatican City State which was created in 1929 as a result of the Lateran Pact. The statue was made by Francesco Nagni (1897-1977) in 1949. Opposite this monument is the one to his predecessor Pope Pius XI (1922-39), the pope of "dauntless faith", of the great social encyclicals, the pope of Catholic Action, of the missions, of the Eucharistic Congresses, of the University of the Sacred Heart. This pope, who could force the devastating consequences of totalitarian regimes, condemned their doctrines from the beginning. Pius XI was also the first Pope Sovereign of Vatican City, a title recognized by the Lateran Treaty (11 February 1929). The monument was created by Francesco Nagni (1949). The monument to Pope Pius XI, with a superficial monumental effect, lacks the human interpretation of the personage. 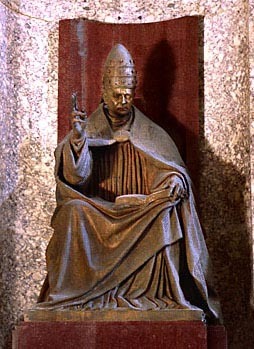 In fact, the artist Pietro Canonica concentrated exclusively on the plastic abilities, trying to accentuate the vertical movement, crowning the figure of the Pope with the "Triregno" which, though placed on a high base, is too heavy in the massive mantle of the woolly chasuble, that here replaces the usual wide cloak. Pius XI was forced to address thirty-four notes to the Nazi government to protest its growing opposition to the Church. The break came in 1937 when he ordered his encyclical Mit brennender Sorge (Ger., "With searing anxiety), denouncing the violations of the concordat and condemning Nazism as fundamentally racist and anti-Christian, to be read from every German pulpit. The letter had to be smuggled into Germany. The Nazi leadership, caught completely off guard, was infuriated and intensified its persecution of the Church and especially of its priests. Pius XI faced a sadly disturbed postwar world, a world threatened and tempted by fascism and communism. Far from yielding to discouragement Pius strove mightily to rally the forces of good and to remedy the times' evils. To remind a materialistic world of the primacy of the spiritual, Pius established the beautiful feast of Christ the King. In thirty encyclicals he shed light on the difficulties of the day. Outstanding were his encyclicals on education, marriage, and above all, on the social problem.